Life Is What Happens: Make it your own!!!! 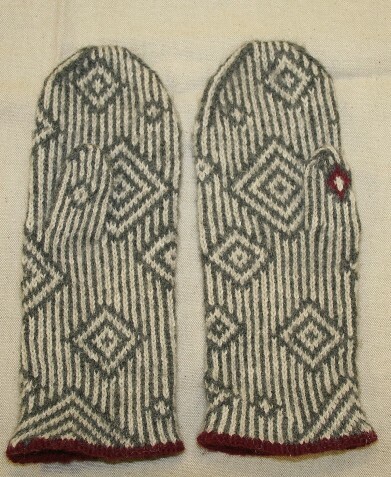 I always love it when a knitter takes a design and makes it his/her own, I posted a while ago about a friend of mine who knit Lucy Neatby's Paradoxical Mittens and added a bit of the red trim to the thumb of the right-hand mitten so that you could always tell your right mitten from your left. Here's the link. These are, of course, organized people. I'm lucky if I remember to go out with mitts and even luckier if they are matching. Now do I have to worry whether I have them on the right err correct hand or not? Anyway, I loved the concept so much that I had to write about it. Now another friend of mine, Julia, has taken a pattern by Le Tissier Designs and made it her own. 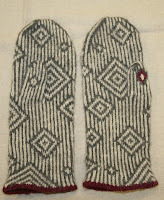 Julia took the basic pattern - Fretwork Fingerless Mitts and re-did the bead work in a pattern of her own design. 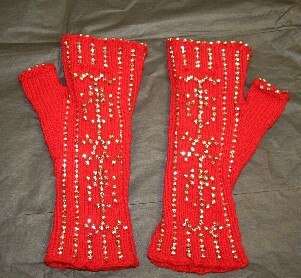 Julia still used Lynette's basic mitt construction, which included a thumb gussett (I have to do it - I'm a gusset groupie) but added these awesome diamond beads in her own pattern and knit mitts to die for. I love Lynette's design; but I also love Julia's and I know that Lynette would love the fact that Julia made them her own! Teacher's are like that! Dinner? I made African Peanut Chicken from an earlier post and it was delicious. I left out the carrot; didn't bother to marinate the chicken and substituted sour cream for coconut milk and it was still delicious!! Please send me examples of your personalized knitting from any pattern that we distribute and I will rave about it!! !